It is probably inevitable that if you visit Japan – it doesn’t matter whether it is major cities like Tokyo, Kyoto, Hiroshima or smaller towns and villages in the countryside – you will also visit numerous Buddhist temples and Shinto shrines. After the first few temple and shrine visits (your mileage may vary), it is also inevitable that you will experience “temple & shrine burnout.” No matter how impressive the temple is or how large the shrine’s torii gate is, after visiting more than a handful in a short period of time, they will lose their distinctiveness and begin to blend into one another. While this is probably due to a variety of factors, such as inadequate descriptions of the temple/shrine’s history in English, the largest reason is simply because most of us do not have the background knowledge needed to make sense of what we are seeing. We don’t have the “code” that allows us to decipher the fundamentals a Buddhist temple or Shinto shrine and then would in turn let us put the temple or shrine into context. This article is the start of a series that will provide the tools to “crack the code” so that you can gain a deeper understanding of Japan’s temples (and at a later date, shrines), enjoy them for more than their architectural beauty, and most importantly prevent any further outbreaks of temple burnout. Before delving into characteristics of Japanese Buddhism and Japanese Buddhist temples, it will probably be helpful to go all the way back to the beginning of Buddhism (don’t worry, this’ll be brief and painless – it’s just to give us some background to build upon) in India. The first disciples of the Buddha (Siddhartha Gautama, Shakyamuni, or “Shaka nyorai” in Japanese) studied and slept outdoors, but because of India’s rainy season, needed a place where they could study and meditate out of the rain. This is the start of or precursor to temples and monasteries. These Buddhist groups lived communally as they studied and proselytized, and gradually living spaces for the monks were created. The first Buddhist temples were only created after the Buddha passed away and all of these earliest temples consisted of a stupa – a mound-like or hemispherical structure in which the ashes of the Buddha (and later, the ashes of Buddhist monks) were interred in – and a monastery. There were no statues of the Buddha in these earliest temples, those didn’t appear until approximately 500 years after Buddhism was created, and at first were simply images of Gautama that were placed around the stupa. About the same time that the first statues of the Buddha were being made, a new school of Buddhism was emerging. This was Mahayana (“Greater Vehicle” or Daijou bukkyo in Japanese) and unlike the original Buddhism which believed that “there is only one world, and only one Buddha – Gautama”, Mahayana believes that “there are many parallel worlds, and an equal number of Buddhas, all of whose purpose is to save mankind.” (Don’t worry, this is going somewhere and will help you understand Japanese Buddhist temples. Really.) During this period, in addition to the stupa and monastery, small halls were erected to enshrine the other Buddhas and Bodhisattvas. This “small hall” came to be the third building in a temple complex and were characteristic of the next generation of Buddhist temples. When Buddhism spread to China, there were changes to Buddhist temples that reflected characteristics of Chinese culture. Primary among these was based on the tenet that “the Emperor faces south.” Based on this, Chinese palaces were built facing south, and it followed that Buddhist temples were also built facing south with statues of the Buddha also facing south. Two other characteristics of Chinese layout were also incorporated. 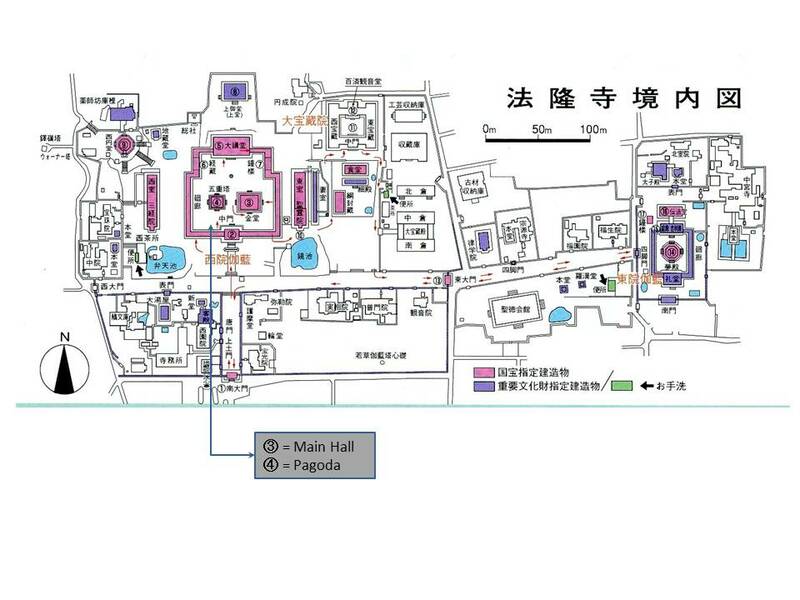 One was that, as the Capitol city was laid out symmetrically left and right, Buddhist temples in China were designed so that the halls (monk’s residences, etc.) were placed symmetrically flanking the Main Hall. 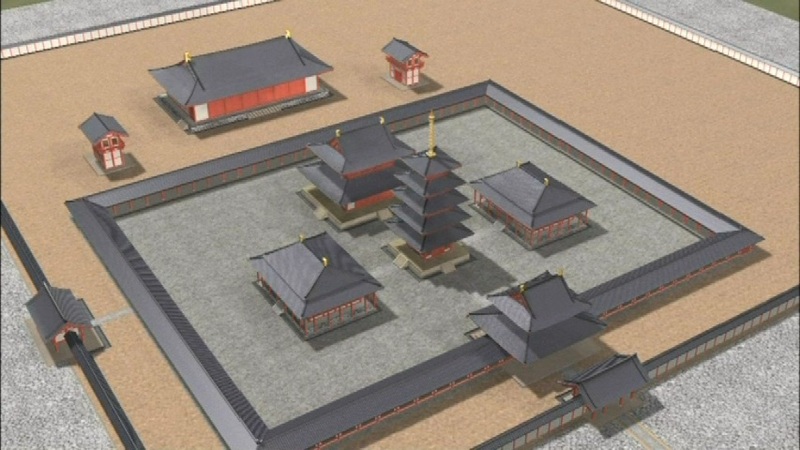 The other characteristic was that temples came to be enclosed by a wall with the main gate facing south, just as the Emperor’s castle in the Capitol was. Buddhism continued to spread throughout southeast Asia and is believed to have reached Japan via Korea in 522 AD (or possibly in 538 AD). Standard Buddhist temple principles also came from the Asian mainland: temples faced south, were surrounded by a wall, and centered on the pagoda. Asuka period (538 – 710 AD) temples center on the pagoda, with the ancillary buildings surrounding it in bilateral symmetry. The placement of the pagoda in the center reflects the importance that it has as the repository for the Buddha’s bones. Temples in the Asuka period were built by the Imperial family or other powerful influential clans. In the Nara period (710 – 794 AD), the temple complex still runs in a north-south axis, but the main hall and pagoda now start to be placed across from each other on the temple’s east-west axis (Example: Houryuu-ji). This reflects the increasing importance of the Main Hall, which is starting to be seen as equal in rank to the pagoda. Hereafter, the Main Hall will gradually become the more important of the two buildings in Japanese temples. Also during this period, temples came to be surrounded by a wall enclosing the complex and extending from the Chuu-mon (“Middle Gate”), which faces south. Buddhism has now become the state religion, and during the Nara period temples are built at state expense and there is a strong relationship between the court and Buddhist clergy. In 794, the Capitol was moved from Nara to Kyoto, with one of the reasons being to separate the court from its involvement with the Buddhist hierarchy. This was the start of the Heian period (794 – 1185), considered to be the peak of the Imperial court and when the influence of Buddhism on Japanese culture was at its height. Early in the period, two new schools of Buddhist thought – Tendai (founded by the monk Saichou) and Shingon (founded by Kuukai) – appeared in Japan and became major forces in the development of Japanese Buddhism during the Heian period. Because large areas of flat, level land in mountains are hard to come by, and make a symmetrical temple design difficult, temples in the Heian period were laid out so that they conformed to the topography of the land. Bilateral symmetry began to disappear from temple layouts. The Tendai and Shingon sects were also instrumental in the merging of Buddhism and Shinto. They espoused the belief that Shinto kami (gods, goddesses, spirits) were simply manifestations of Buddhist deities, and from this time until the forced separation of Buddhism and Shintoism in the late 1860s, Shinto shrines were located on and in Buddhist temples. Although the Capitol had been relocated so that the clergy wouldn’t have as much influence on the court, about 100 years after the relocation, politics and Buddhism became close again, both physically and figuratively. Monzeki were a good example of this relationship. Monzeki are members of the Imperial family or nobility who have become Buddhist priests and/or those temples that are staffed by monzeki priests. Despite the flourishing of Buddhism during the Heian period, this was also a time of unease. Many believed that the Age of Mappo (The Decline of the Dharma Law) started in 1052 and that during this degenerate age, people would be unable to attain enlightenment because they had become incapable of following the teachings of the Buddha. It was in this period that the Jodo (“Pure Land”) sects of Buddhism began to gain popularity in Japan. While Buddhism flourished in the new Capitol of Kyoto and was the religion of the court and nobles, the military class was beginning its rise to power in the provinces. This rise was due largely to the abolishment of the universal conscription of peasants for the Imperial army, and a turn to reliance on the provincial governors (minor nobility) and their local militias to supply men and horses as needed to fight the emperor’s battles. Decentralization had begun. Although supervision of the governors was close at first, gradually it lessened and the governors with their private armies could run their provinces freely. This continued for the next hundred years with rivalries between major clans for control of the imperial court escalating into a series of rebellions and culminating in the Gempei War. The victors of this war, the Minamoto clan, would go on to establish the Kamakura Shogunate – a military government that controlled all of Japan. Society shifted dramatically from the world of the nobility to that of the warrior elite. This change brought a rise in the popularity and influence of Zen Buddhism. Zen Buddhism believes that enlightenment comes not from without – via the study of sutras or rituals – but from within and in the midst of everyday life, through meditation, self-reliance, and personal experience. This outlook fit in well with the warrior mentality, with its focus on simplicity, and restraint, with an emphasis on physicality. Both Zen and Bushido (the “way of the warrior”) prize discipline and orderliness in all things and as Zen increased in popularity, regular, symmetrical temple design began to return. Another characteristic is that Zen Buddhist temples are built in satoyama (those border areas that lie between mountain and flat, arable land) and are always surrounded by nature. In addition to Zen Buddhism, the Pure Land sect became even more popular than it had been, and a new sect – Nichiren Buddhism – appeared on the scene. All three of these sects had one thing in common: they stressed the belief of a pure and simple faith over ornate and secret rituals. They were also devoted to the salvation of the common man, and the idea that all people (not just the elite or monks) could achieve enlightenment. Buddhism now began to spread amongst the populace and become the religion of common man as well as the court and aristocracy. While there is still a lot left to discover and de-code when visiting a Japanese temple (Don’t worry, there will be more articles shortly and through them you will become a Temple Code-Breaking Master, able to amaze and impress friends everywhere), the most basic fundamentals of “reading” a temple have been presented and by using them, you will be able to get more out of your visits to the many temples of Japan. 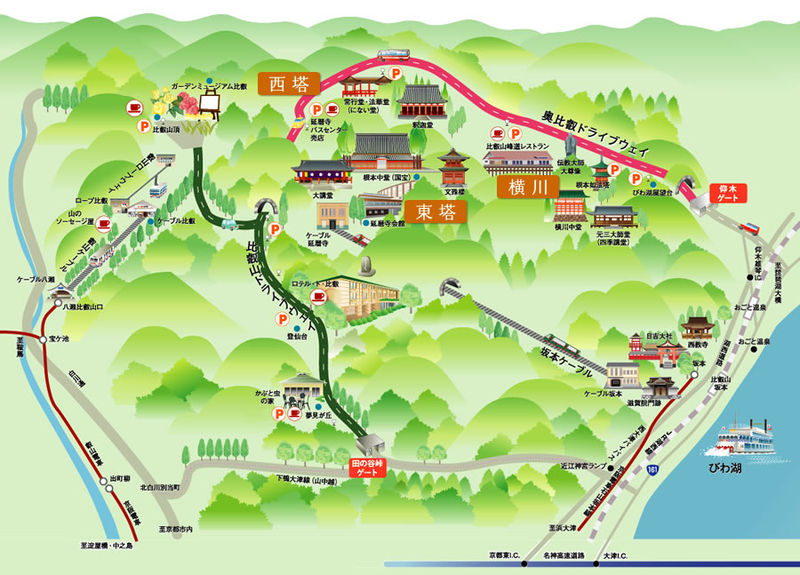 Most Japanese Buddhist temples are lined-up in a north-south axis, with the Main Gate to the south. NOTE: Pure Land temples will be oriented east – west, with the Main Gate to the east. The earliest temples are built with the pagoda as the center and other buildings surrounding it. In the Nara period, the Main Hall came to be the center of the complex and other buildings (pagodas are the most obvious example) were laid out symmetrically opposed to it on a east – west axis. Most temples are found in urban areas. 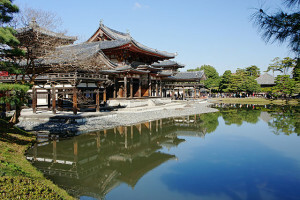 If the temple is located in mountainous regions and has no clear symmetry to its layout, the chances are that it was built during the Heian period, and is likely to be a Tendai or Shingon temple. Zen temples began to appear in the Kamakura period and have as their focus the Lecture Hall rather than the Main Hall (where Buddhist statues and enshrined) and are again laid out symmetrically. They are characteristically surrounded by nature and found in satoyama areas (at the boundaries of mountains/hills and flat land).